KAMPALA- Teargas and live bullets rocked Kampala City for the most part of Monday morning as riots broke out in the centre and suburbs as Ugandans demanded the release of MPs in their “People Power” pressure. Crowds chanting “people power, our power” took to the streets at Kisekka Market, Wandegeya, Mini Price, William Street, Kamwokya, among other areas and the security responded with live bullets and hitting some with sticks. Businesses closed as angry people burnt tyres and papers. 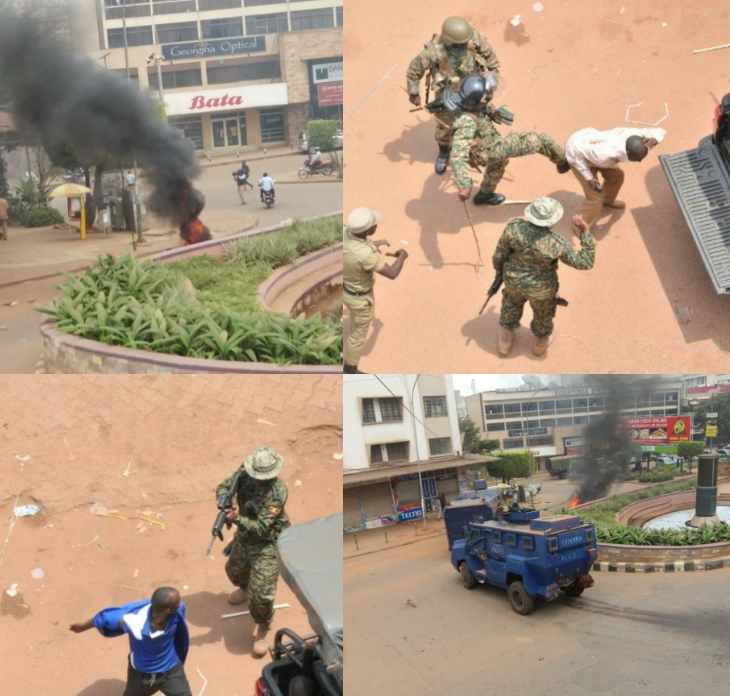 Bombo Road, Kyaggwe Road, Namirembe Road, Katwe Road among others were closed as the military quelled the riots. Kyadondo East MP Robert Kyagulanyi aka Bobi Wine was charged before the General Court Martial in Gulu and remanded to Makindye Military barracks in Kampala. Protestors are demanding the release of detained and tortured legislator Bobi Wine and other lawmakers detained in Arua. The fracas in Arua left Bobi Wine’s driver Yasin Kawuma dead and others with gunshot wounds. Over 30 people including MPs and journalists were arrested.